A two step process but well worth the extra bit of effort in the end. 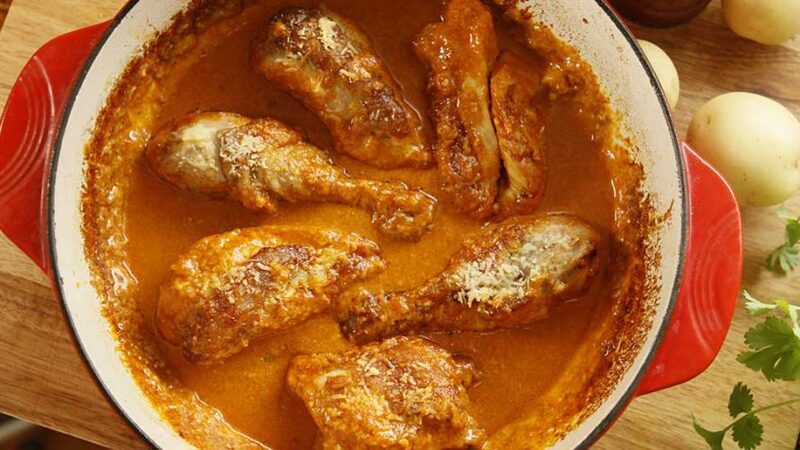 This dish is similar to the Poulet Gaston Gerard who used to be the maire of Dijon after 1919. This dish was invented by accident during a dinner party when the paprika accidentally fell in the pot. To soften the paprika intensity, white wine and cream was added. It since became a classic recipe in Bourgogne France. Place an oven proof pot on high heat and melt the butter. Coat the chicken pieces in the flour and to pot, add slat and pepper and brown each side. Deglaze the pot with the white wine and bake in oven for 15min at 350°F – 180°C for 15 minutes. Grate the Parmesan cheese if not already done and set aside. Remove chicken from oven (15 mins later) and transfer chicken pieces to a plate and leave aside. To the same pot with chicken juices left, add the cream fraiche, the paprika and the mustard. Keep a little grated cheese for later and add the rest of the grated cheese to the sauce as you mix it with a wooden spoon. Return the chicken pieces skin side up by placing them into the sauce. Top with the left over cheese and bake in oven for another 15min at 350°F – 180°C.